1. Clear a space in the freezer big enough for the ice lolly mould to sit flat. 2. Spoon 2 tbsp of your chosen spirit into a small saucepan. Add the sugar and heat gently until it has dissolved. When there are no visible granules, remove from the heat and pour into a measuring jug. 3. Add the remaining spirit and your chosen mixer to the jug, and stir to combine. Taste the mixture to check the balance (it should taste a little stronger and sweeter than you would usually like because the cold dulls the flavour slightly) and adjust as desired. 4. 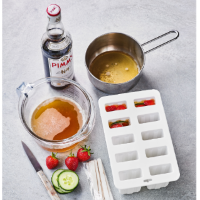 Place any fruits or herbs (see variations, below) into each lolly mould, then fill to the top with the mixture. Position the sticks into each lolly, then freeze until completely frozen (at least 6 hours) before enjoying as a refreshing treat! The lollies will keep for up to 3 months in the freezer.